Party food season is well upon us and these pad thai prawn cups are a welcome break in a beige buffet. These little lettuce scoops are a great flavour refresher during the Christmas period. 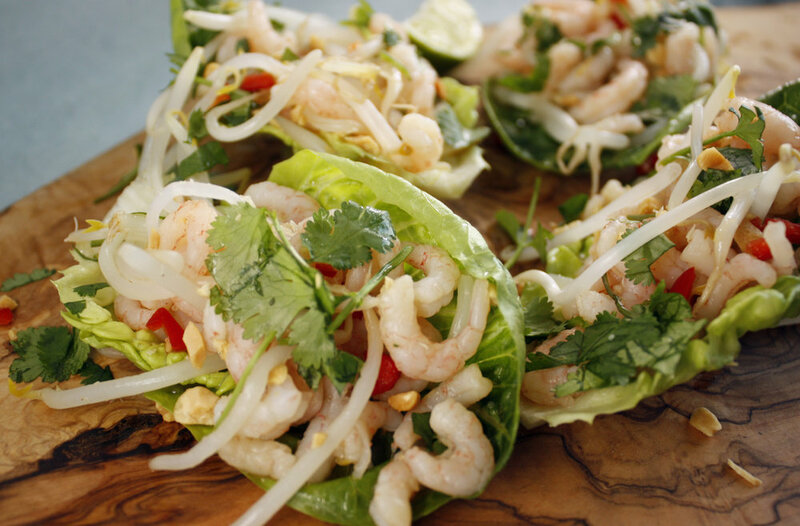 Bringing a hit of fragrant Thai flavours they’ll liven up the table and your taste buds. For those wanting to cancel out all that mulled wine and mince pies with something a little lighter, these hand-sized nibbles are perfect. Heat a couple of tsp of vegetable oil in a wok or large frying pan. Add the prawns, garlic, beansprouts, lime juice, fish sauce and sugar. Quickly toss together for 1 min more until the prawns are heated through and everything is well mixed. Add the beansprouts and chilli at the last minute and heat through for a few moments tossing the pan as you go. Take the mix off the heat and put to one side to cool. You could serve these hot but as they are finger food there is a risk of burning fingers. We’d suggest leaving ample time between cooking and serving to cool the mix a little. Right before getting the dish on the table separate the lettuce into 10 cups and fill with the pad thai mix. Top your cups with crushed peanuts, coriander and a squeeze of lime. Dot extra chilli and lime around the table so your guests can customise their own.